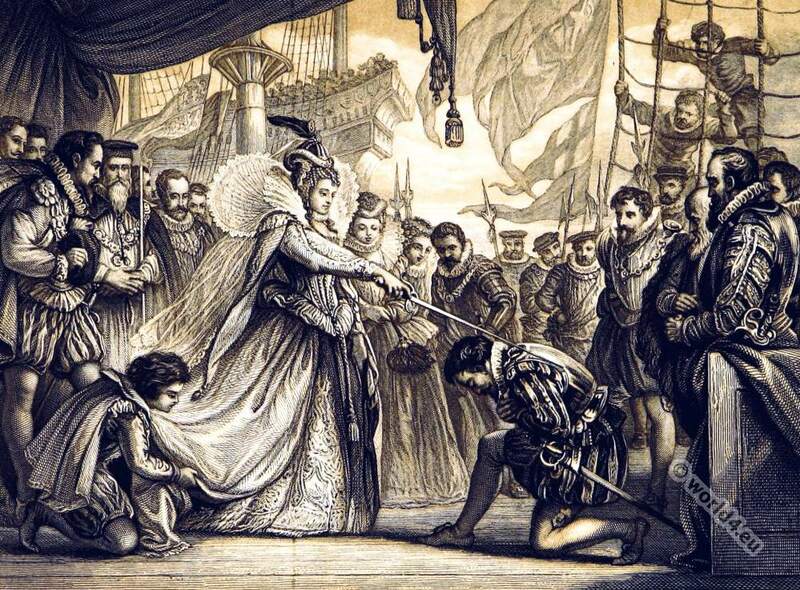 Queen Elisabeth knighting Drake on Board of the Golden Hind at Deptford April 4th 1581. 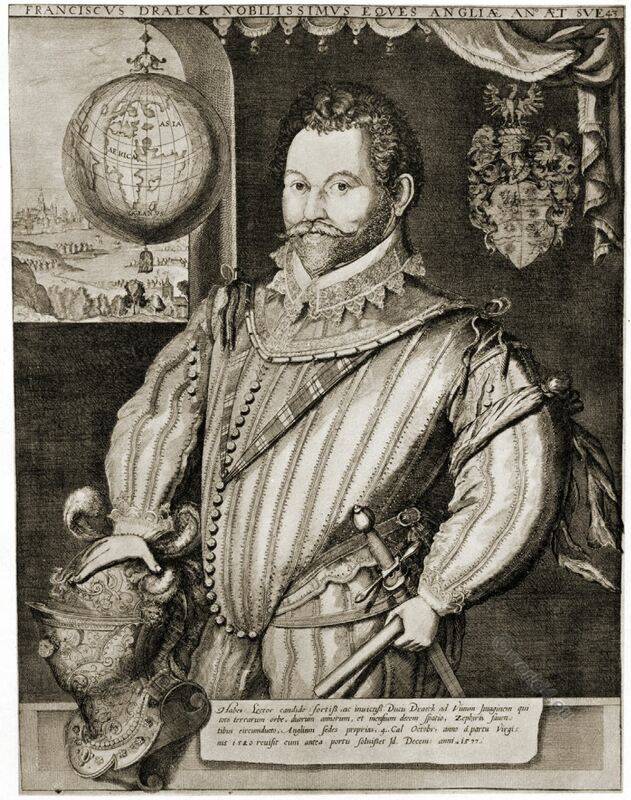 Sir Francis Drake (around 1540-1596) was an English privateer and explorer, later vice-admiral and the first England captain who sailed round the world. As a navigator and sailor, he is still regarded as one of the outstanding personalities of the English seafaring. 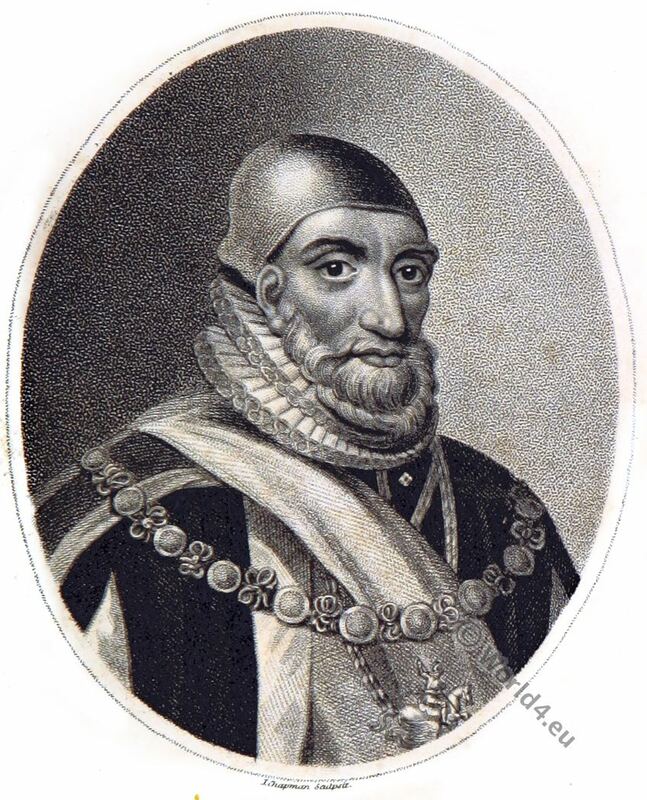 Sir Fancis Drake ( c. 1540 – 28 January 1596). English sea captain, privateer, navigator, slaver, explorer, later vice-admiral and the first English world sailor during the Elizabethan era. It was in the reign of Elizabeth that the sovereignty of the sea was transferred from Spain to England. Through the century and a half which intervened between the death of Edward III. and the fall of Wolsey, the English sea-going population, with but few exceptions, had moved in a groove in which they lived and worked from day to day and year to year with unerring uniformity. The wine brigs made their annual voyages to Bordeaux and Cadiz; the bays plied with such regularity as the winds allowed them between the Scheldt and the Thames; summer after summer the Iceland fleet went north for the cod and ling which were the food of the winter fasting days; the boats of Yarmouth and Rye, Southampton, Poole, Brixham, Dartmouth, Plymouth, and Fowie fished the Channel. The people themselves, though hardy and industrious, and though as much at home upon the ocean as their Scandinavian forefathers or their descendants in modern England, were yet contented to live in an unchanging round from which they neither attempted nor desired to extricate themselves. Yet Columbus had discovered a new world. Cabot, sailing from Bristol for Cathay, had struck the American continent at Nova Scotia, passed into the Greenland seas till he was blocked by ice, and then coasted back to Florida, returning with the news of another continent waiting to be occupied. Yet English mariners turned away from these enterprises, and it was left to Spain in that grand burst of energy which followed on the expulsion of the Moors and the union of the Crowns, to add a hemisphere to the known world, and found empires in lands beyond the sunset (Froude). But Henry VIII., having to look to the defences of his kingdom after having set himself against the pope, began to develop the navy, and with characteristic energy commenced the building of great vessels which he himself designed. Giustiniani found him in 1518 practising at Southampton with his new brass artillery. The Great Harry was the wonder of northern Europe, and the fleet afterwards collected at Spithead was the strongest that had ever floated on English waters. Mariners and merchants soon caught the influence of the time, and, after Mr. William Hawkins of Plymouth “armed out a tall and goodly ship” wherein he sailed for the coast of Guinea, and there trafficked with the negroes for gold dust and ivory, and then crossed the Atlantic to Brazil, a trade was opened which was to be the beginning of that wonderful commerce which has ever since distinguished the English mercantile marine. Sebastian Cabot was appointed by Edward VI. to the title of grand pilot of England, and the spirit of adventure grew among merchants and gentlemen, who fitted out trading expeditions which were also devoted to exploration. The accession of Elizabeth found commerce leaving its old channels and stretching in a thousand new directions, while from India, Persia, Turkey, Russia, the south of Europe, came articles of hitherto unknown luxury and ornament or of almost invaluable utility, and from the New World was brought rare woods, dyes, precious metals, pearls and new varieties of food. For a time Cecil endeavored to protect the fishing trade by carrying an act of parliament to ordain the eating of fish on Fridays and Saturdays; but the mariners and the larger vessels were out on a different kind of service, engaged in that English mercantile fleet which was scattered about the world, and each vessel in which, having first to protect itself, and afterwards being led to attempt reprisals, became a sea-rover sailing on expeditions half genuinely commercial but certainly half piratical, and wholly devoted to the detriment of the power of Spain and to the assertion of English liberty and freedom of conscience against the arrogant assumptions of Empire and the fanatical persecutions which accompanied the Spanish policy. Indeed it may be said that the mercantile fleet was at war with Spain, partly with the concurrence of Elizabeth, who did not scruple to allow privateering all the time that she was listening to the representations of Philip’s ambassadors, or the complaints of other foreigners, and affecting to take stricter measures for the repression of piracy and buccaneering. At length it became a system of reprisals, until, when war was declared, and the Spanish Armada threatened an invasion of England, this continued animosity found an occasion for the leading captain adventurers to take command in the English fleet. Sir John Hawkins 1532 – 1595. English naval commander and administrator, merchant, navigator, shipbuilder, privateer, pirate and slave trader. As one of the first English slave trader, he acquired through trafficking between Africa and the West Indies great wealth. Their names are many of them familiar to us, along with those who went forth with them upon the sea to protect England from the powerful attempt of her enemies. Hawkins, Drake, Winter, Frobisher, Palmer, Seymour, Southwell, Sheffield, Fenner, were with Howard at that council of war which was held in his cabin, where it was determined to drive the Spanish vessels out of the shoal water with fire-ships and then to attack them in the open channel. There were others whose names are famous in English history who had been concerned in the “adventures,” of which explorations, trading with savages, burning Spanish “Plate” ships, taking galleons, and even attacking and pillaging Spanish stations, formed a part. Foremost among these bold navigators was Francis Drake, the man whose name and deeds are familiar not only to readers of history, but to every lad who lingers with thrilling interest over stories of brave achievements and discoveries. 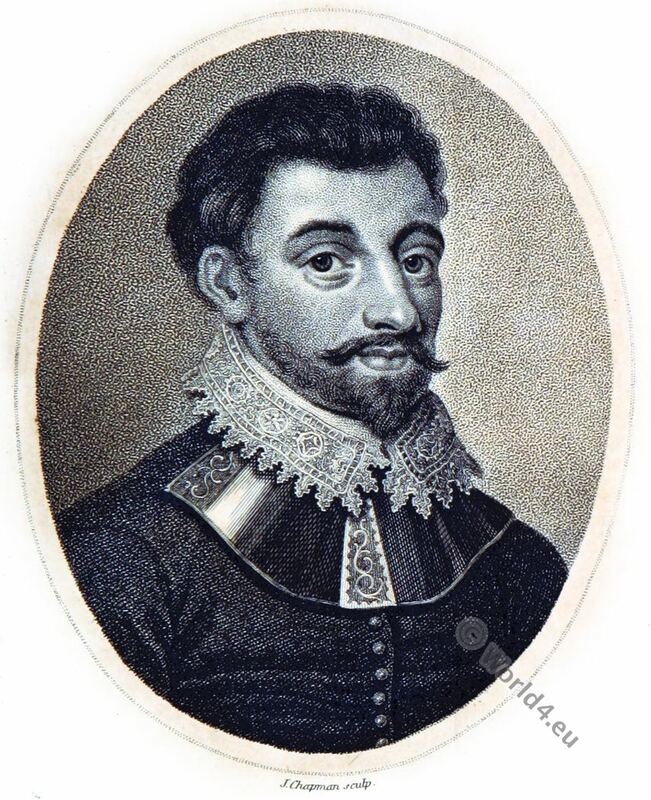 There is some confusion in the accounts of the conditions of Francis Drake’s early life, but it is certain that he was born on the banks of the Tay, in Devonshire, in 1546. His father is said by some to have been a poor yeoman, by others a mariner, who as a Protestant was compelled to take refuge in Kent during the reign of Mary, but who afterwards, on the accession of Elizabeth, obtained an appointment to read prayers to the seamen of the Royal Navy. Young Francis Drake, who was thus brought up among sailors, was the eldest of twelve sons, and was apprenticed to the master of a bark trading to Zealand and France. With him he acquired a thorough knowledge of seamanship, and his master bequeathed to him the vessel and its equipments, with which he continued to trade long enough to acquire some property. At the age of twenty-two he sold his vessel, and embarked with Sir John Hawkins, his kinsman and early patron, in the last expedition of that famous navigator to the Spanish main. Sir John Hawkins had in fact entered into the trade of procuring slaves from the coast of Guinea and disposing of them for merchandise elsewhere. He had made a profitable business by two or three voyages, but on this last occasion, being driven into the port of St. Juan D’Ulloa by stress of weather, his vessels, of which Drake commanded one, were at first mistaken for a part of the Spanish fleet. Hawkins acted in good faith, and though there were several merchantmen which he might have taken, agreed not to prevent the entrance of the Spanish vessels of war into the bay; but having once permitted them to pass in, they treacherously attacked him,and though he and Drake with their crews fought so desperately as to sink and burn several of the Spaniards, only these two vessels of the squadron escaped, the rest being lost beside all their money, the cargoes of merchandise, and the lives of a great number of their followers. From this time Drake was the implacable enemy of Spain, and sought every opportunity for making reprisals, and after some smaller expeditions obtained a kind of privateering commission from Elizabeth, and in 1572 sailed with two small vessels, the Pasha and the Swan, and a force of only 73 men, with whom he took and plundered the town of Nombre de Dios on the Isthmus of Darien. Thence he went to Vera Cruz, where he obtained more booty, and afterwards intercepted on the land route fifty mules laden with silver. 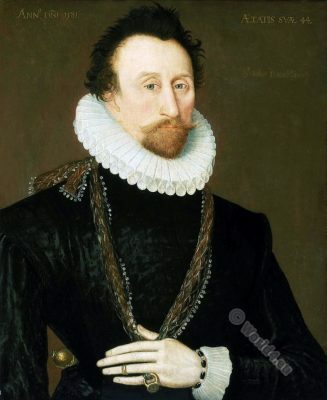 In August, 1573, he returned in triumph, his vessels full of wealth and his name already so renowned that, after serving with distinction in Ireland with three frigates fitted at his own expense, he was introduced to the queen by Sir Christopher Hatton. He had long cherished the desire to make a voyage in the South Seas through the straits of Magellan, and it is said that, having unfolded his plan to Elizabeth, she at once commissioned him but secretly and only as a privateer, at the same time saying, “Who striketh at thee, Drake, striketh at us,” words sufficiently suggestive of her participation in the probable success of the enterprise, and in the wealth which it might secure. The story of that wonderful voyage of the Pelican, afterwards called the Golden Hind, and the four other small vessels with their pinnaces and 164 men, has been told over and over again, and is ever fresh and full of interest. It is a story of battle, exploration, discovery, and the accumulation of treasure both by plunder of Spaniards and trade with hitherto unknown people. Along the coasts of Chili and Peru sacking towns, and so by the shores of California and North America, named by him New Albion; thence to the Moluccas and Java, and afterwards doubling the Cape, and reaching Plymouth again amidst acclamations and rejoicings on the 3d of November, 1580, Francis Drake made the voyage round the world in two years and about ten months. 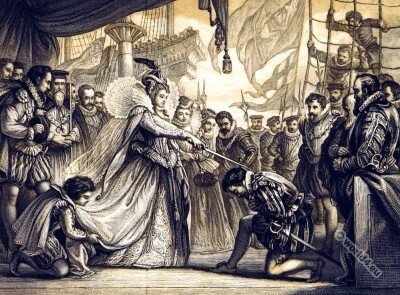 Not only his bold exploits but the large amount of treasure which he brought back commended the expedition to Elizabeth, and though for some time she delayed acknowledging her authority, she treated the representations of the Spanish ambassador with silence, and ultimately, when the Golden Hind lay at Deptford, went on board to a grand state banquet, at which she was the guest of the victorious captain, on whom she bestowed the honor of knighthood. Concealment of her opposition to the arrogant claims for compensation made by Spain was no longer necessary, for war had become inevitable. The Golden Hind was to be preserved as a monument of the captain’s achievements, and when it at last fell to pieces a chair made out of its timbers was sent to Oxford. In 1585 threats of war became violent, and Drake, with a fleet of twenty sail and a force of 2300 soldiers and marines, was sent against the Spanish settlements in the West Indies, where he took St. Jago, St. Domingo, Carthagena and St. Augustine. Two years afterwards he “singed the King of Spain’s beard,” by sailing with a fleet of thirty ships to the very coast, where, in the harbor of Cadiz, he burned 10,000 tons of shipping destined to form part of the invincible Armada, and also destroyed a hundred vessels between Cadiz and Cape St. Vincent and four castles on the shore. Again he was fortunate in capturing a richly laden carrack near Terceira on his homeward voyage, and so satisfied the merchant adventurers who had helped to fit out the expedition, beside adding to his own wealth, a portion of which he spent in bringing pure water into the town of Plymouth from a distance of nearly fifteen miles. In 1588 the great Armada was threatening England, and the sturdy, bright-eyed, compact-headed captain was appointed vice-admiral of the British fleet, under Lord Howard of Effingham, who took the chief command in that memorable engagement. Source: Pictures and Royal Portraits illustrative of English and Scottish History by Thomas Archer. London 1878. 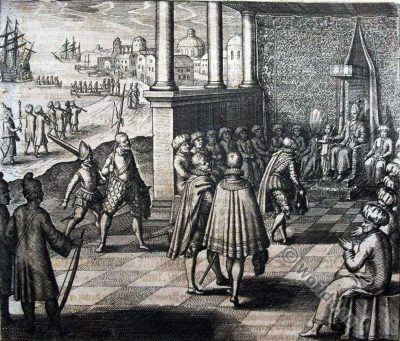 The visit of Sir Francis Drake to Sultan Baabullah of Ternate in the Spice Islands (Moluccas) in 1579. “The king (Sultan) having promised to come aboard, brake his promise, but sent his brother to make his excuse, and to entreat our General (Drake) to come on shore, offering himself pawn aboard for his safe return. Where unto our General consented not, upon mislike conceived of the breach of his promise; the whole company also utterly refusing it. But to satisfy him, our General sent certain of his gentlemen to the Court, to accompany the king’s brother, reserving the vice-king for their safe return. They were received of another brother of the king’s, and other states, and were conducted with great honour to the castle. The place that they were brought unto was a large and fair house, where were at the least a thousand persons assembled. page with a fan in his hand, breathing and gathering the air to the king. The same was in length two foot, and in breadth one foot, set with eight sapphires richly embroidered, and knit to a staff three foot in length, by the which the page did hold and move it. Our gentlemen having delivered their message and received order accordingly, were licensed to depart, being safely conducted back again by one of the king’s council. This island is the chief of all the islands of Maluco, and the king hereof is king of 70 islands besides. The king with his people are Moors in religion, observing certain new moons, with fastings; during which fasts they neither eat nor drink in the day, but in the night. This entry was posted in 1577, 16th Century, England, Nobility, Renaissance, Tudor and tagged English history, Pictures and Royal Portraits, Renaissance fashion era, Tudor period on 6/10/15 by world4.